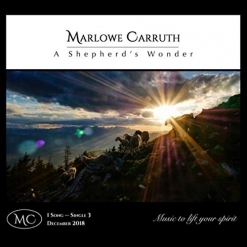 "A Shepherd’s Wonder" is a beautiful new Christmas single by pianist/composer Marlowe Carruth, a nominee for Enlightened Piano Radio’s Best New Artist of 2017 award. Marlowe composed the piece last Christmas (2017) after reading the Christmas story in Luke 2. As she was meditating on the various emotions the shepherds must have experienced, she tried to capture those feelings in the music. She then worked with the amazing and very intuitive Doug Hammer as he orchestrated the piece “exactly as I felt it and then some!” The results are truly exceptional! The piece begins as a very gentle piano solo with string washes that enhance the peaceful tone of the music. Harp, more strings and light percussion are added, evoking images of a dark sky and twinkling stars. At that point, the piano and strings start to build in intensity as the music swells and becomes fully orchestrated, suggesting the angels descending to tell the shepherds that Jesus was born. As inspiring as it is beautiful, this is a wonderful new addition to the Christmas music repertoire! "A Shepherd’s Wonder" is available on Spotify, Amazon, iTunes and CD Baby as well as other streaming sites.